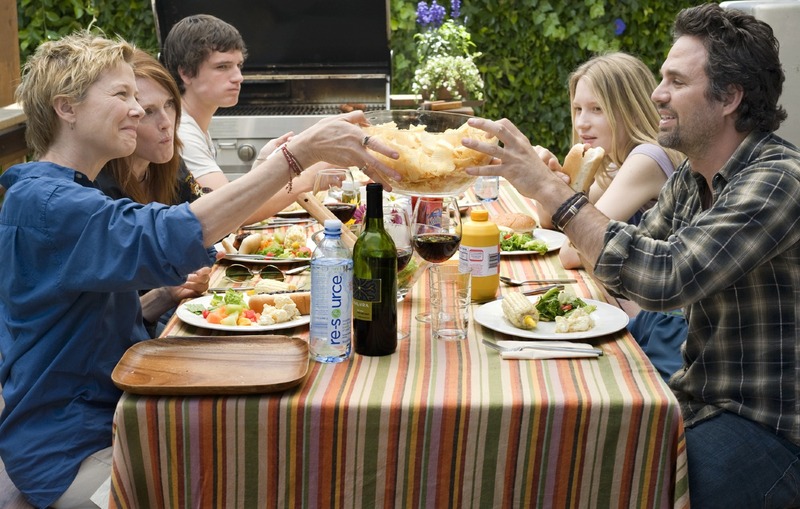 Jules (Julianne Moore) & Nic (Annette Bening) are a happy couple with two great kids they have bought up well, in a household with love and care. Nic is a obstetrician, organised and focused whilst Jules is more of a free spirit, repeatedly starting projects and currently dabbling in garden design, which is a source of tension but no more than many millions of couples. The long term relationship is sound, albeit going a little stale, again they may not be alone in that predicament. The children were born with the aid of an anonymous donor and whilst happy, the kids Joni (Mia Waikowska) and Laser (Josh Hutcherson) are curious as to who the person that shaped their lives, actually is. According to US law they can request this information once they reach eighteen and Joni makes contact on behalf of her brother. Accepting the request for contact is Paul (Mark Ruffalo), a rough and ready bohemian restaurant owner. Paul is very keen to become of the Kids lives and this has benefits all round despite some initial misgivings by Jules and Nic. Laser gets a father and male influence in his life, perhaps steering him away from his more unsavory friend choices. Joni gets to see an alternative lifestyle at a time when she needs to pull away from her mothers’ apron strings. All is well but then, it becomes more complicated. All the cast are uniformly good, the acting is natural and the script allows the characters to react in believable ways. Petty jealousies, slights and betrayals, just normal human behaviour played out in ways we can all understand, no matter the orientation of the couple featured. The film is more serious than might be expected and it is targeted at a “mature” audience, not necessarily in age but for people who know and understand that life is more grey than black and white. Bening & Moore make a screen couple that are entirely plausible, Ruffalo brings a rough diamond aspect to his role yet manages to make the character likeable and convincing as the plot unfolds. Both the children provide sterling support, accepting without question their two mums. Whilst stating the obvious, director and writer Lisa Cholodenko, manages to relay the message that children will thrive in any environment where they are cared for and loved, a situation not exclusive to a “straight” partnership. A well acted family drama with first class acting and mature themes explored in a believable way, deep but accessible and with just enough humour to make this an enjoyable and easy watch.